King Solomon advocated prudence in all things – a combination of knowledge and careful thinking that leads to prosperity and a life blessed by God. “To know wisdom, and instruction; to understand the words of prudence,” he says in the first two verses of the Book of Proverbs. 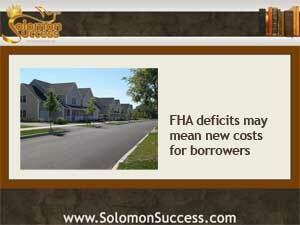 With reports of new FHA home financing policy changes coming in June 2013, words of prudence for home owners and investors might be: finance or refinance now. After the housing collapse of 2008 that resulted in record numbers of foreclosures and homeowners in danger of foreclosure, a number of mortgage assistance programs were created and offered by both mortgage lenders and government housing agencies such as Fannie Mae and Freddie Mac and backed by the FHA, which was responsible for funding bailout programs like HARP (Homeowner Affordable Refinance Program). But now, the FHA’s Mutual Mortgage Insurance Fund, its primary source for supporting mortgage assistance programs, is running at a severe deficit –over $16 billion for the fiscal year 2013. Because the FHA must maintain a federally mandated reserve of funds, this means that costs to program applicants must rise – with a ripple effect across the housing market as a whole. According to the newsletter of the Department of Housing and Urban Development, June 3, 2013 is the date set for implementing the new belt-tightening rules affecting both mortgage insurance and interest rates on some government backed financing and refinancing arrangements. New rules on mortgage insurance tie payments to tighter standards for down payments on mortgages. Under the new regulations, both investors and residential homebuyers who can put down over 10 percent of the loan amount up front will end up paying mortgage insurance only for the first 11 years of the loan. But although applicants who can’t come up with a down payment of this size can still qualify for the loan, they can expect to pay mortgage insurance payments for the entire life of the loan. For large mortgages or refinances in loan amounts over $650,000, the required down payment – or, in the case of refinances, the amount of equity in the home – will increase. Currently set at 3.5 percent of the home’s total value, this amount rises to 5 percent after June 3. This change is likely to affect owners of large residential homes and investors purchasing or owning multiplexes. Add these FHA rule changes to predictions that mortgage interest rates across the board are expected to rise – reaching an estimated 4.9 percent by the end of 2013 – and there’s a pretty good argument for acting now to start the mortgage process, or to apply for refinancing help through private lenders or any of the homeowner assistance programs funded by the FHA or related agencies.